Our latest collection of uncivilised writing and artwork, Dark Mountain: Issue 11, is now available. Over the next few weeks, we're going to share a little of what you'll find in its pages. Today we get you started with the editorial. When things get messy, people reach for straight lines. In times of confusion, the impulse to take refuge in simplicity – simple choices, simple forms of identity, simple stories – can be deeply reassuring; borders keep entities intact, not just apart. Liminal spaces and in-between zones are things to be feared and avoided. Constructing barriers, real or imagined, is part of an ancient cultural drive to divide the black from the white, and push troublesome grey areas back into the nacreous realms of the subconscious where they belong. History, especially Western history, provides much evidence of the urge to micro-manage reality’s mess. With the simplicity of hindsight the Enlightenment is viewed as a time in which the shadowed superstitions of the past were exposed and swept away, ushering in a rational age of quantification, measurement and ordered progress. Carl Linnaeus, the Swedish botanist and zoologist dubbed the ‘father of taxonomy’, classified plants and animals into formal hierarchies of kingdoms, classes, orders, genera and species, sorting the seeming chaos of life into a bestial simulacrum of the European class system. In the age of empire – itself an exercise in standardisation as well as military might – much of this systematising drive came from the British Isles; Luke Howard classified the clouds according to Linnaean principles, Francis Beaufort numbered the winds, and the world was divided into time-zones bisecting the globe as neatly as the segments of an orange. Geologists split time itself into eons and eras, epochs and ages that gave the impression of orderly transfer – the Devonian giving way to the Cretaceous like a peaceful handover of power – anchoring our species against the horror of deep time. But the lines separating these things remained – and remain – illusory. Such borders, powerful though they seem, are only one way of seeing the world; like so many human inventions, they are better understood not as facts, but stories. Dark Mountain: Issue 11 takes as its premise the notion of endings – cultural, social, ecological, political, existential – but recognises that things seldom end, or begin, in well-mannered ways. All very dramatic (and great for news soundbites) until we step back a bit to take a longer view. Is this the dawn of a new era, or rather a tired rehashing of all-too-familiar narratives – national pride, purity, redemption after decline and corruption – just another strand of the time-worn myth of progress? At a time when we need alternative stories more than ever, the twentieth century seems caught on loop: industrial capitalism occasionally spiked by nationalism, occasionally screened by liberalism, but the cogs of the machine keep whirling much the same. Beyond the political-cultural babble the coal plants are still being built, the mountains are still being levelled for mines, the bottom-of-the-barrel scrabble to prop up fossil fuel economies continues with tar sands and fracking, the sale of SUVs booms, and – despite feel-good nativist posturing to the contrary – extractive globalisation proceeds apace, driven by the seemingly unstoppable logic of consumption. As a corollary of this, the oceans continue acidifying, Indonesian forest fires raze millions of hectares of trees, another Antarctic ice shelf calves, and nonhuman species blink out of existence everywhere on Earth. Still we grasp at solid lines. We border ourselves with a global temperature rise of 1.5°C – a number picked as much for its neatness, and political practicability, as what it actually represents in terms of dangerous climate change – raising the target above our heads like a roof in stormy weather. We bemoan passing the symbolic threshold of 400 parts per million of CO2 in the atmosphere – a level last seen in the Pliocene, four million years ago – as if everything was ‘normal’ back at 399. Perhaps most reductively, we tell ourselves that the Holocene has given way to the Anthropocene, an epoch that signifies total human dominance of the planet. But such divisions are seldom so tidy. Even the convenient border drawn between humans and animals – the ultimate ‘us and them’ – degrades with the uncomfortable fact that our bodies comprise at least as many bacteria cells as ‘human’ cells; it makes more sense to think of ourselves as colonies of organisms rather than individuals. Once we break free from straight-line thinking, the truth is much more messy. That messiness is, in part, what this book tries to articulate. Dark Mountain: Issue 11 takes as its premise the notion of endings – cultural, social, ecological, political, existential – but recognises that things seldom end, or begin, in well-mannered ways. The uncivilised writing and artwork you will find within these pages explores the liminal territory between simplistic poles; an untidy realm in which some worlds appear to be ending completely, some partially, some not at all, and in which entirely new beginnings emerge from the cracks in between. Tim Fox suggests that the apocalypse, that hackneyed staple of environmental doom-scenarios, is not some future fantasy but, in ecological terms, an event already underway; but also that mass extinctions lead to mass diversifications. From a Hebridean pilgrimage Alastair McIntosh reminds us that apokalyptein originally meant not the end of all things, but the revelation of something hidden; Charlotte McGuinn Freeman, meanwhile, takes us on a personal journey through family tragedy and explores what happens next, after the world stops. Essays by John Rember, Daniel Nakanishi-Chalwin and others take a long, hard look at the common end that awaits us all, while a striking image from Tanja Leonardt suggests that life, of a sort, continues in the war-ravaged ruins of a Bosnian factory. Much of the content is rooted in home: Sarah Thomas sends dispatches from a flooded Cumbrian fell, Francesca Schmidt from a village in the former East Germany, and Garry Williams cuts a temporary home from a raft of ice on a frozen Norwegian lake. Darren Allen coins new terms for a world in dramatic – and often humorous – flux, while the Confraternity of Neoflagellants brings us a kind of ‘high-tech uncivilised’ writing we’ve never seen before. Elsewhere Matt Miles views human migration as the canary in the coal mine of ecological disruption, Caroline Ross sources art materials from a world that ended a thousand years ago, and Jane Lovell’s poetry sifts through the paleological rubble of cosmic upheaval. As old certainties unravel ever more suddenly, and with consequences that grow increasingly unpredictable, our eleventh publication reflects these turbulent times as they are: uncivilised, seldom straight and defiantly unsimple. We hope you enjoy the diversity of beginnings and endings inside, and join us in navigating new stories among the remains of the old. Part explorer. Part outcast. Part survivor. From the series No Man’s Land by Canadian artist Will Gill, these images were made during an artist residency in Svalbard, Norway, in the autumn of 2014. Twenty-eight artists from around the world sailed aboard a three-masted barquentine to one of the most forbidding environments on the planet. 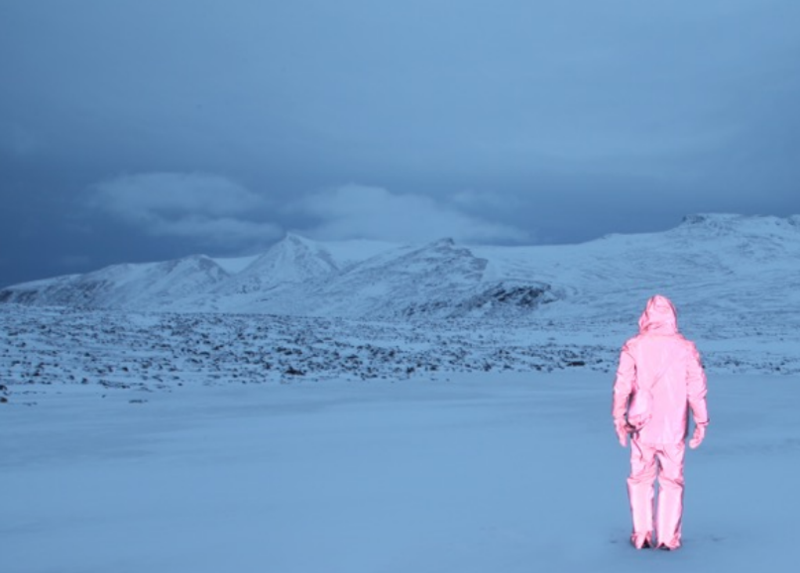 Accompanied by sculptural props and a custom-made light reactive suit, the artist set out to stage photographs in the alien landscape. The results explore aspects of life somewhere near the end: resignation, curiosity, boredom, hope, wonder and despair.